I seem to have banged on this year rather more than usual. I make no apology for that, nor am I nervous that it will it make a jot of difference. I shall still be thought to be kindly, cosy and essentially harmless. I am in the pigeon-hole marked 'no threat' and did I stab Judi Dench with a pitchfork I should still be a teddy bear. Encounter Alan Bennett as he is best experienced, in his own words. 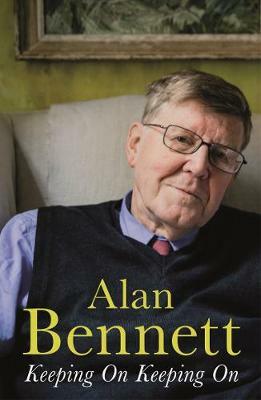 We at Waterstones have been listening to the distinctive, wry and understated warmth of Alan Bennett’s voice since his early years on radio. From his own readings of his diaries to his short fiction, bittersweet and unfailingly funny, including Father! Father! Burning Bright and the miniature masterpiece of storytelling The Clothes They Stood Up In. Alan Bennett's third collection of prose, Keeping On Keeping On, follows in the footsteps of the phenomenally successful Writing Home and Untold Stories, each published ten years apart. This latest collection contains Bennett's peerless diaries 2005 to 2015, reflecting on a decade that saw four premieres at the National Theatre (The Habit of Art, People, Hymn and Cocktail Sticks), a West End double-bill transfer, and the films of The History Boys and The Lady in the Van. There's a provocative sermon on private education given before the University at King's College Chapel, Cambridge, and 'Baffled at a Bookcase' offers a passionate defence of the public library. The book also includes 'Denmark Hill', a darkly comic radio play set in suburban south London, as well as Bennett's reflections on a quarter of a century's collaboration with Nicholas Hytner.